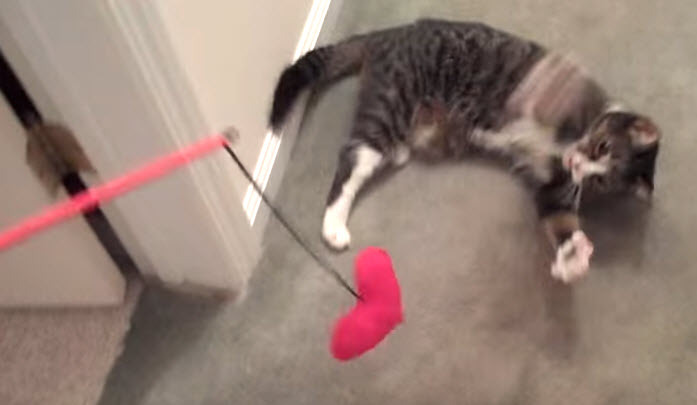 Make a special wand for your cat as a Valentine’s Day present! Paint a wood dowel pink or red. Cut out two matching hearts from a piece of red or pink felt. Sew the edges of the hearts together, leaving a small hole at the top. Stuff the heart with shredded paper and catnip, then sew the hole shut with one end of a rope inside the seam. Tie the other end of the rope around one end of the wood dowel once the paint has dried.